Beer festivals are a great place to go if you love beer, beer and more beer. They offer plenty of choice and the chance to try something new, proving popular all over the UK, especially in Yorkshire. Beer festivals have grown more and more popular over the past few years, now usually serving a wide selection of not only beer, but other alcoholic beverages, and providing live musical performances and delicious homemade food. Yorkshire offers a wide selection of different beer festivals around the region throughout the year, so even though they provide a great place to go to during the spring and summer months, the beer festival fun continues all year long. Starting tomorrow, this popular festival with return once again, offering over 135 real ales and over 30 different ciders. This event will take place at Hull Minster and will also boast hot and cold food stands, and CAMRA Tombola and live acoustic music. Located in York, this popular festival is now in its 4th year and will return again in May, taking place on Friday May 4 & Saturday May 5. With over 20 real ales, this festival offers a wide range of beer, but if beer isn’t your tipple of choice, there will be English wines, Yorkshire ciders and even a Gin & Fizz Bar, which is a new addition to this year’s festival. This festival also provides fun for all the family on the Saturday, with live music, a bouncy castle, inflatable assault course, sumo suits, bin drumming, and even a pizza van. On May 7, from 11:30 am - 5:00 pm, there will be another annual Cathedral Beer Festival, which will take place in the grounds of Ripon Cathedral. Here there will be a range of award-winning beers, refreshing ciders and pimms, alongside local food and live music. 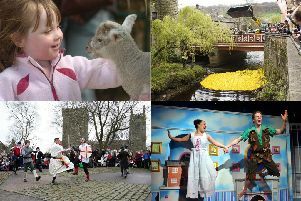 There will also be a bouncy castle, face painting and a craft table, meaning the whole family a fun day out at this North Yorkshire festival. On May 11-12, Heeley City Farm, located in Sheffield, will be hosting their first ever Beer Festival. Eight local breweries and one local distillery have donated both ale and gin, which the public will be able to purchase, all in the hope of raising funds for the upkeep of the farm. This beer festival will also include live music on the Saturday afternoon between 14:00-17:00pm, with acts including Rob Lowdon and Paul Pearson & Friends. This popular Craft Beer Festival is now in its 5th year, after first being created in order to mark the craft beer revival. This year’s festival will be held at the Milton Rooms in the heart of Malton and will have not only beer, but delicious street food and live music. The beer list will showcase an eclectic range of beers, in both cask and keg, from a wide range of breweries not only in the UK, but further afield. Each year the members of Leeds CAMRA, the Campaign for Real Ale, put together the biggest and best selection of real ales, ciders and perries and showcase them in Leeds. This year’s festival will take place in June and will have a splendid selection of beers from all over the globe, a wide array of tasty food and even live music from local bands. This country pub is renowned for its selection of real ale and each year it holds a highly attended beer and cider festival. Popular with the locals, this year’s festival will take place in the month of September, with the exact dates still to be confirmed. This festival is set to be an enjoyable weekend full of tasty beer, food and live music, providing full for all the family. The annual Leeds International Beer Festival will return this September for it 7th year running, providing a fun festival in the heart of Leeds. This festival will celebrate and promote over a 100 craft beers from both the UK and abroad, and there will also be a street food market and live music which will play across two stages. One of the largest Beer & Cider Festivals in the whole of the North of England, this popular beer festival returns once again this year. Held on York's famous Knavesmire in a large marquee opposite the York Racecourse Grandstand, this festival offers over 450 Real Ales and over 100 ciders, including a foreign beer bar, world wines, a food village and even a huge outside beer garden. This popular event returns once again this October, combines some of the region's most loved beers with a fantastic selection of music. There will be over 100 different types of ale, live music at all the stations and on all of the trains, making it a popular event with not only locals, but people from all over the region and further afield. There will also be a wide selection of cider and wine, and live music at both the Exhibition Hall in Oxenhope and in the marquee at Ingrow. Planning is currently busily underway for the 24th Cropton Beer Festival, at the The New Inn, Cropton, North Yorkshire. This popular festival will take place between Friday November 16 to Sunday November 18 and will boast a large marquee selling over 80 real ales, craft beers, traditional ciders and lagers. In the past this beer festival has been described as legendary by CAMRA, and this year’s festival intends to be the same, serving not only beer, but live music and delicious homemade food.